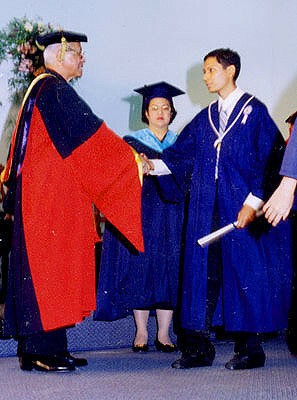 This is my graduation from Ateneo de Manila in 1998. (Yeah, I was pretty thin and slouchy back then.) The graduation “celebration” dinner that followed was something I don’t remember with much fondness. The next time I would shake hands with Father Nebres would be seven years later. you’re taller than i thought, if you’re slouching! You almost look like a bike racer!